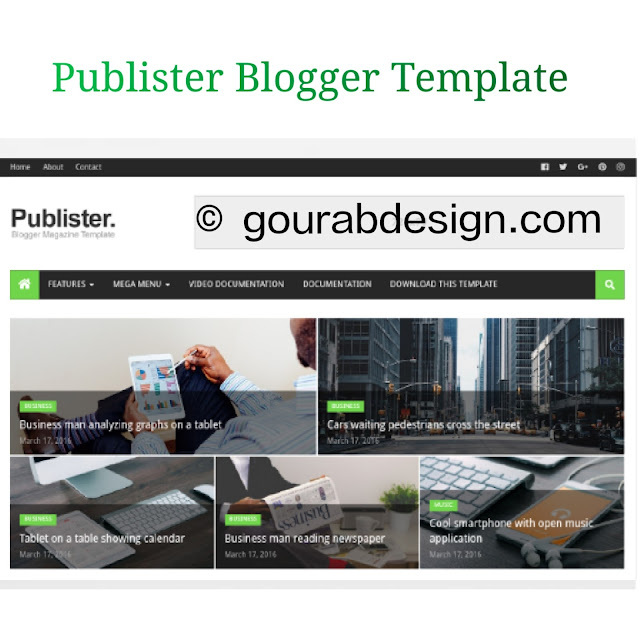 Publister - Tech Blogger Template has been optimized to provide the best user experience on speed and performance. It is ideal for many niches that include news, newspapers, politics, sports, games, technology, travel and more. The subject is completely answered on iPhone, iPad and Android phones and tablets. Best theme to Technology website because its designed to looking professional your blog. This blogspot theme has been professionally created using high quality widgets to represent your content to the most important publications. In addition, it is based on the latest version, and some of these magezines are supported by many new features on the internet. This topic has questions like SEO ready, ready for ads . widgets, etc. This theme is combined with white, black and green background color. This with many features and capabilities. Provide custom homepage layouts with the latest published labels. The publisher has widgets that will help you publish your blog more professionally. If you have questions about the magazine blogger template, you will write in the comments section. You can contact me directly on Facebook. If you would like to receive our latest email updates, sign up for free. Enter our Google+ profile to get the latest free theme. If you like this update, do not forget to share it with your friends. Thank you..